I first fall in love with hiking but since my work and schedule don't allow any chance for hiking anymore, I opted for running as my way to strengthen my health and to stay fit. But, before I became a member of GenSan Run Club, I would just do solitary running along a local mall with less excitement. This scenario had leveled up when I joined trail running along with GenSan Run Club runners. So, my itch for hiking and running was rightfully subdued and when my partner has to join us and to take our pictures, trail running has become more fun. We wish to promote General Santos City and other parts of South Cotabato as one of fun running destinations. 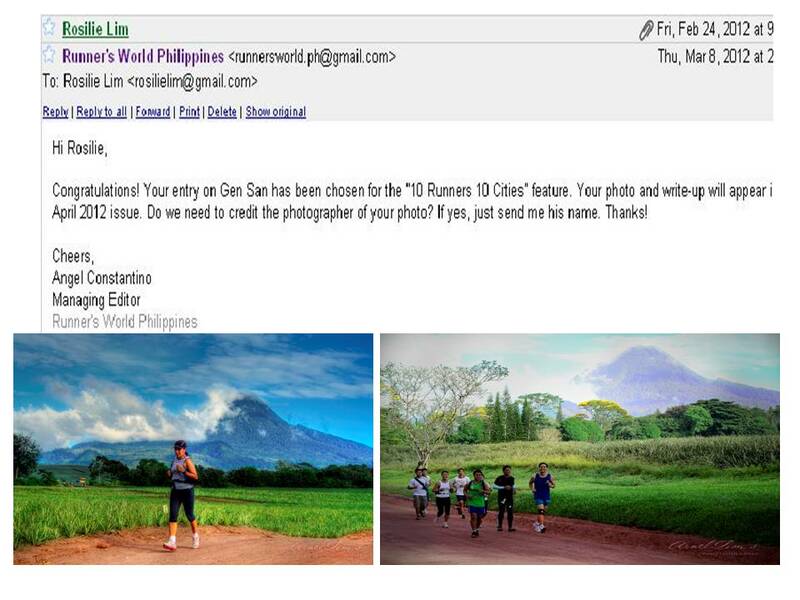 So, when Runner's World Philippines opened its invitation for local runners, I promptly submitted my piece and the efforts were not vain as we were selected for April 2012 issue. So, come April, this mommy runner shall be featured in one of the renowned national running magazine!